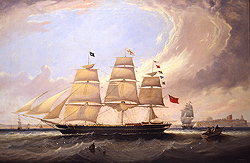 John Scott is most noted for his marine and landscape paintings. Born in South Shields, he spent his early life at sea before becoming a pupil of John Wilson Carmichael. Similar to his master, Scott painted marine subjects, but unlike Carmichael, remained in Tyneside his entire life. As a resident of Tyneside, being a superb painter/recorder of her ships and ports, he was well known and greatly appreciated by the community. Scott worked diligently and successfully, depicting Tyneside’s colliers, keel boats, tugs, and wrecks. On occasion he recorded major public events that involved shipping; a fine example of this is his work titled Opening of Tyne Dock, 1859. Scott was described by art historian C.H. Ward Jackson, in his book Ship Portrait Painters, published 1978, National Maritime Museum, Greenwich, England, as: an excellent and productive specialist in portraits of merchantmen off points of land as far apart as Dover and Cape Town. It is possible that Jackson base his views on several of Scott’s works in the Museum’s collection which date from 1851 to 1870. However, Scott was completely involved with maritime life, he was also skilled at creating models of ships, yachts and other marine vessels. In 1851, he participated in the Great Exhibition in London; a competition organized by the Duke of Northumberland, and was awarded a medal for one of his models. A truly prolific and competent marine artist, Scott painted throughout his entire life and lived to the ripe old age of eighty-three. He died at his daughter’s home in South Shields.